Dry to moderate moisture. Open woods, prairies. Full to partial sun. This is an erect perennial forb rising from a short, ascending to vertical caudex. It is usually 12″ to 27″ tall but can reach up to 40″ in height in favorable conditions. A whorl of usually 5 to 10 basal leaves rises from the ground at the top of the caudex. Basal leaves are on 3½″ to 8¼″ long leaf stalks (petioles). The leaf blades are broadly inversely egg-shaped in outline and are divided into three leaflets. The terminal leaflet is unstalked, broadly diamond-shaped or inversely lance-shaped in outline, 1¼″ to 2″ long, and 1½″ to 4″ wide. It is narrowly wedge-shaped at the base and cut at the tip into 3 lobes. The lobes may be shallow or deep, and often have secondary lobes. The ultimate lobes are sharply pointed. The surfaces are covered with straight, stiff, appressed hairs, more so on the lower surface. The margins are toothed with sharp or rounded teeth. The lateral leaflets are similar but sometimes deeply divided into 2 segments, causing the leaf blade to appear at first inspection to be divided into 4 or 5 segments. A single flowering stem rises from the caudex at the base of the whorl of leaves. At the top of the stem there is a whorl of 3 leaf-like involucral bracts (sometimes called involucral leaves) and 2 to 8 (usually 3 or fewer) flowering stalks (peduncles). 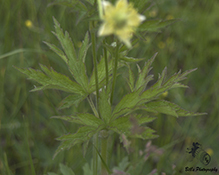 The involucral bracts are conspicuously stalked and similar to the basal leaves. 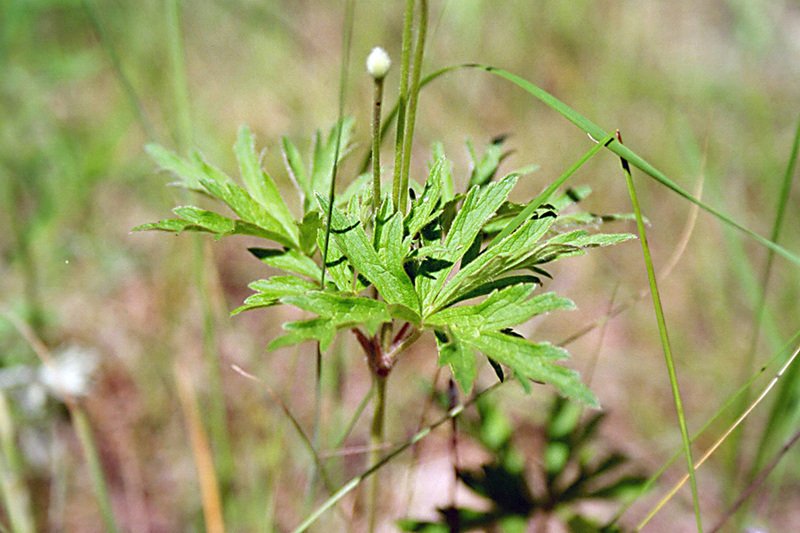 The stem leaves are conspicuously stalked; moderately to densely covered with fine, short hairs, more so on the lower surface; and are smaller but otherwise similar to the basal leaves. They are in two or three ranks, though they sometimes appear one-ranked, and three of the leaves are much larger than the rest. The inflorescence is a single flower at the end of each peduncle. Each peduncle is 4″ to 12″ long, unbranched, and moderately to densely covered with long, soft, shaggy, unmatted hairs. 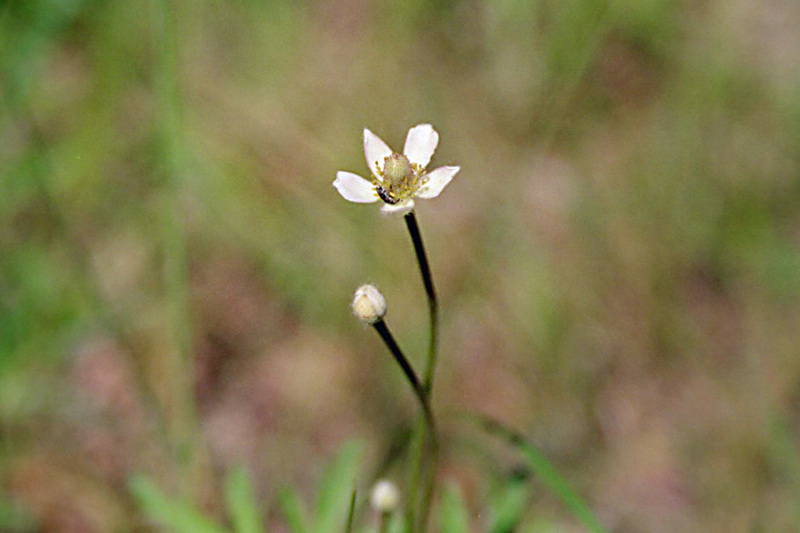 There peduncles are bare, with no secondary involucral bracts. 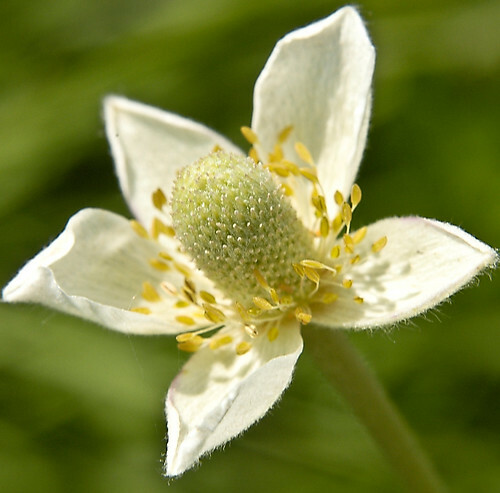 The flower is about ¾″ in diameter. 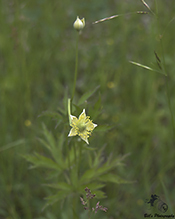 There are no petals, 4 to 6 (usually 5) petal-like sepals, and 50 to 75 stamens with yellow anthers. 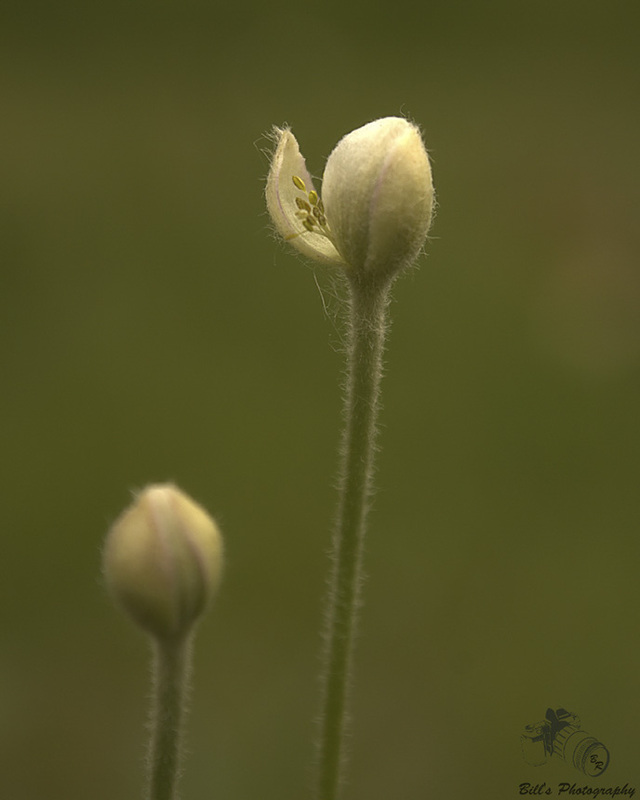 The sepals are oblong to elliptic or egg-shaped, greenish-white, 5 ⁄16″ to ½″ long, and ⅛″ to 3 ⁄16″ wide. The flowers have no scent. 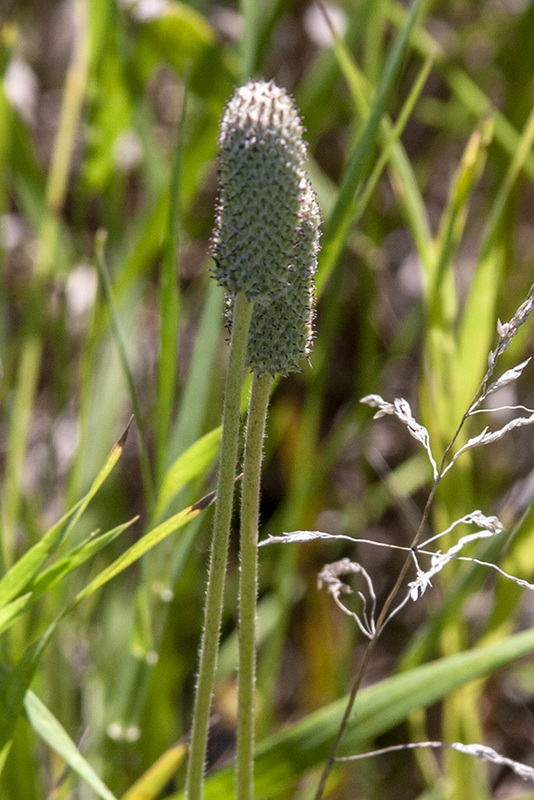 The infructescence is a dense, thimble-like fruiting head. 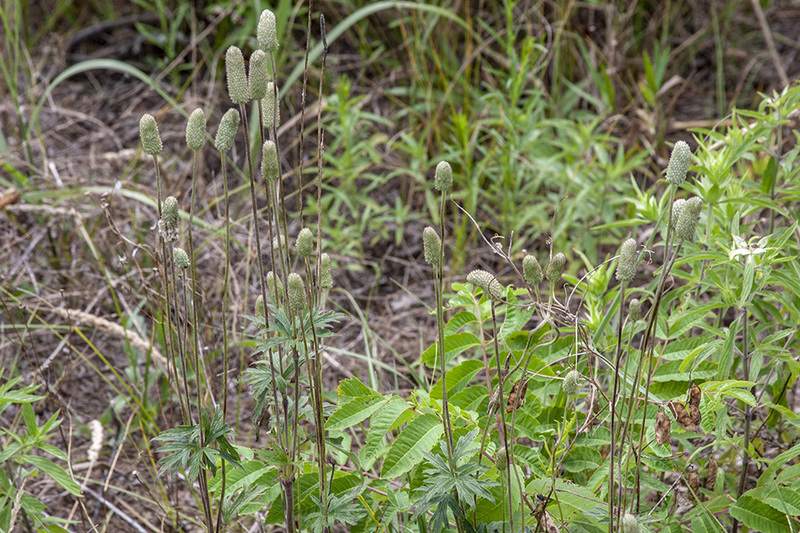 It is densely woolly, narrowly cylinder-shaped. It is up to 1½″ long, ⅓″ wide or less, and at least twice as long as it is wide. The fruit is an achene with a tuft of hair attached to the end. In the fall when the achenes mature the fruiting head appears cottony. 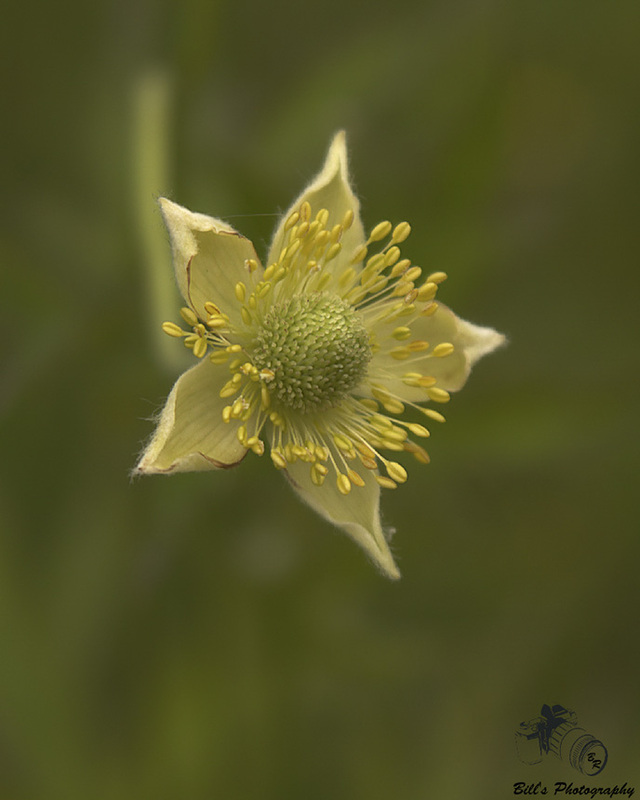 Tall thimbleweed (Anemone virginiana) has a shorter, wider, more prickly fruiting head. 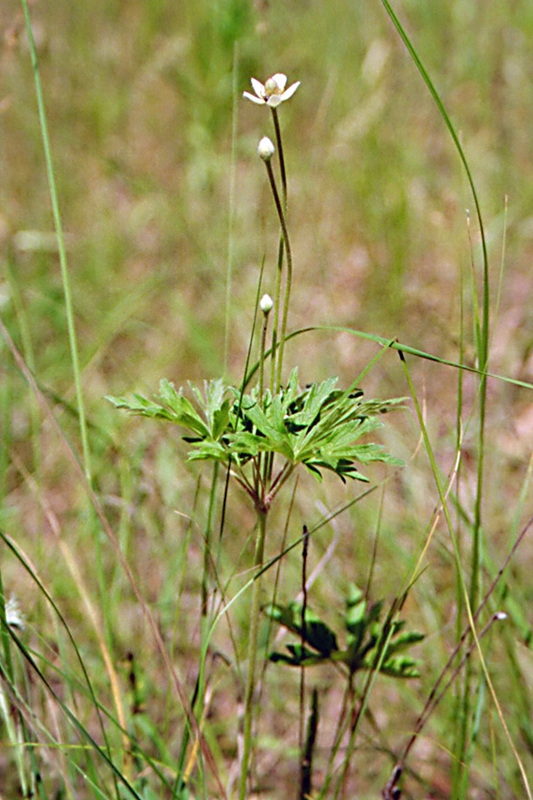 It has only 3 leaves in a whorl at the base of the flowering stalk. There is a pair of leaf-like bracts on usually all but one of the flower stalks. Distribution Sources: 2, 3, 4, 5, 7, 24, 28. A dry, one-chambered, single-seeded fruit, formed from a single carpel, with the seed attached to the membranous outer layer (wall) only by the seed stalk; the wall, formed entirely from the wall of the superior ovary, does not split open at maturity, but relies on decay or predation to release the contents. A short, thickened, woody, persistent enlargement of the stem, at or below ground level, used for water storage.